The last six weeks of a ewe’s pregnancy are particularly important, as it is during this time that the nutritional requirements for foetal development are greatest. Growth during this period accounts for two thirds of a lamb’s birth weight. Adding to the challenge of meeting these nutritional requirements is the reduced rumen capacity due to the growing foetus encroaching on this space. The nutritional requirements for twin or multiple bearing ewes is considerably higher than for ewes carrying single lambs; energy requirements alone being 15% greater. Because of this additional need, it is best where possible to run multiple bearing ewes as a separate management group. The ability to feed a ewe with multiple foetuses accordingly, has numerous benefits for both the ewe and lamb, and can reduce the likelihood of lambing difficulties and ewe and lamb mortalities. The protein requirements of pregnant ewes are also very important, but unfortunately often overlooked. For maintenance a pregnant ewe’s diet should contain 10% crude protein (CP). Without adequate dietary protein, a ewe will be forced to mine her body reserves, converting muscle tissue to enable foetal growth to occur. If there is inadequate dietary protein/nitrogen, the ability to utilize energy from feed diminishes because protein is also crucial to a healthy population of rumen bugs. Depending on the quality of fodder available, it may be necessary to provide additional protein via supplementary feeding with high protein grains such as lupins. 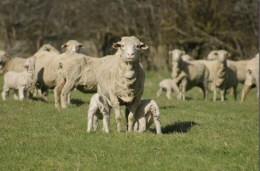 In cases where dietary nutrition is not adequate to sustain both foetal growth and the ewe’s energy requirements, it is common for symptoms of pregtox to become evident. As foetal development has high energy demands, less glucose is available for the ewe’s brain function, and therefore she may appear disoriented, straying from the flock, stumbling and bumping into objects. They may also seem unaware of the presence of people or dogs and frequently will display a loss of appetite. As the condition progresses the ewe may slip into a coma and left untreated may die. When there are sheep showing symptoms of pregtox, you can be sure there are many more borderline pregtox animals not showing symptoms, indicating a greater underlying issue with their nutritional intake. In the early stages of pregtox, registered products containing propylene glycol can be administered; rapidly increasing blood glucose levels, restoring brain function. However without adequate nutrition this is only a temporary fix. Often, prevention is better than the cure. To reduce the incidence of lambing difficulties, and maximize lamb and ewe survival, there is no substitute for appropriate nutritional management.